75.4 million — that’s how many millennials live in the US. Millennials, who are categorized as those between 18 and 34 years-old in 2015, have surpassed the Baby Boomers and are now the largest living generation in the country. By 2020, one-third of all US adults will be millennials. As the largest population in the United States, millennials are changing the way people think about philanthropy. 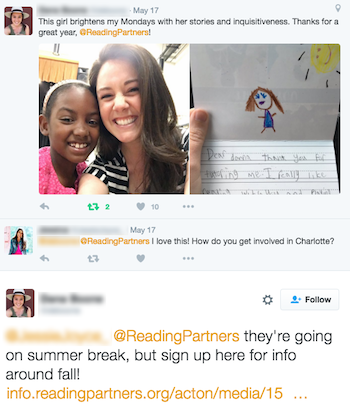 And Reading Partners, along with other nonprofits, is already taking notice of the giving movement this impassioned generation is creating. Have you ever watched a 20-something text or navigate the internet? It’s impressive. Millennials have grown up in the age of technology evolution, enabling them to connect with their peers instantaneously through Facebook, Twitter, Snapchat, and a myriad of other communication platforms. While it might be frowned upon to be ‘connected’ to phones/laptops/tablets at all times, this generational quirk is reinventing word-of-mouth marketing, and in doing so, is elevating the work of nonprofits everywhere. If a millennial tweets about an organization they support, hundreds of people have the ability to see it, look it up, become a believer, and advocate to their networks too — all of which can happen in a matter of minutes. We see this social media magic happen every day. In Baltimore, a community volunteer made a video and posted it on her Facebook page — a call to action to her network to get out in the community and read with Reading Partners’ students. Since posting, her video has been shared with and seen by more than 4,000 people. In the weeks that followed the post, Reading Partners Baltimore experienced an uptick in volunteer sign-ups. Sharing simple and compelling messages online is easy when you are passionate about a cause. Thankfully, millennials are great at it and inspiring others to take action and change lives everyday. Philanthropy in the form of time and money both benefit from millennials’ interest in sharing what they love to do with others. Millennials aren’t just talking about the causes they love, they are actively participating. Research indicates that millennials, more than any other generation, want to feel invested in and connected to the causes they care about. As an organization that recruits thousands of community volunteers and hires hundreds of AmeriCorps members to change young readers’ lives, we can’t stress this enough: we love millennials and their eagerness to help change the world. 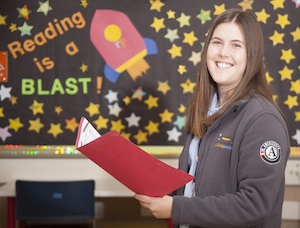 For Stephanie Lehman, giving time is important, so much so that she gave two years of her time to volunteer as an AmeriCorps member for Reading Partners Charleston. “I wanted to take the time to give back to a community in need,” Stephanie says. “I love to read, and I wanted to share that love with students.” After two years of service, Stephanie transitioned to a full-time program associate with Reading Partners Charleston, which is not an uncommon next step for Reading Partners AmeriCorps members. Employers are also making it easier for millennials to monetarily support local causes. According to a report completed by The Case Foundation, 84 percent of millennial employees gave a charitable donation in 2014, and it was because their employers made giving a company-wide priority. Corporations like Boeing, MeadWestvaco, and Blackbaud all provide matching dollars for either volunteer hours or donations made to a nonprofit. When millennials know their donations count for double, it makes it even more rewarding to give even a small amount to a specific cause. It’s time to squash the negative stereotypes of millennials and see the true potential of a creative, generous, and talented generation that will soon lead our economy and workforce. Millennials are getting involved, whether it’s dedicating a year of service in AmeriCorps, volunteering during a one-time event like Day of Caring, or giving a gift on Giving Day. Every hour and every dollar matters, and these gifts will continue to help thousands of children across the United States look forward to a bright future.